Bottleblondegal: Buffy's Rozae Nichols Floral Lace Top in "Crush"
Buffy's Rozae Nichols Floral Lace Top in "Crush"
In S05E14 "Crush" of Buffy the Vampire Slayer Sarah Michelle Gellar / Buffy Summers can be seen wearing a floral lace top by the brand Rozae Nichols. The scene is at the start of the episode while at the Bronze. 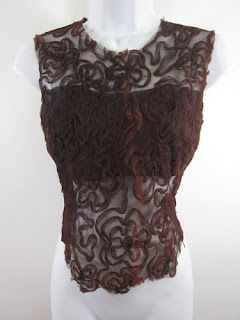 The top has a crewneck, floral embellishments, sleeveless and is made of 100% rayon. The top also comes in blue, but the one Buffy wears is in the shade brown. Spike: "Jackin' up the bar price to pay for fixin' up this sinkhole. Not my fault insurance doesn't cover act of troll." Buffy: "Gee, maybe it's time you found a new place to patronize." Spike: "I've half a mind to! Especially since the flowering onion got remodeled off the sodding menu."